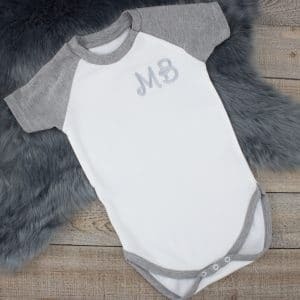 This stylish Personalised White & Grey Trim Baby Bodysuit is the perfect addition to every little ones wardrobe, made from 100% cotton making it soft to touch against baby's delicate skin. This item can be personalised for free of charge, simply let us know baby's intials below to monogram onto their new bodysuit! 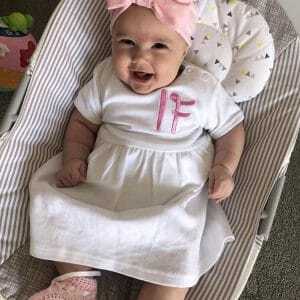 This stylish Personalised White & Pink Trim Baby Bodysuit is the perfect addition to every little ones wardrobe, made from 100% cotton making it soft to touch against baby's delicate skin. This item can be personalised for free of charge, simply let us know baby's intials below to monogram onto their new bodysuit! Brighten up your little girls summer wardrobe with this adorable 100% cotton Personalised Summer Dress. A simple yet elegant design, with a button up back for an easy changing time that can be personalised free of charge. To personalise, simply let us know your little Princess' name in the personalisation box below! 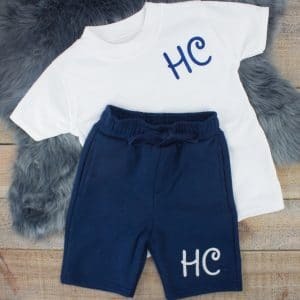 Introducing this seasons must have monogrammed navy baby loungewear set, that includes matching 100% cotton grey t-shirt & shorts for a stylish look whatever the occasion. To personalise, simply add your little boy's intials to the text box below! 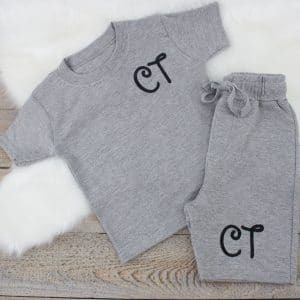 Introducing this seasons must have monogrammed grey baby loungewear set, that includes matching 100% cotton grey t-shirt & shorts for a stylish look whatever the occasion. To personalise, simply add your little one's intials to the text box below! 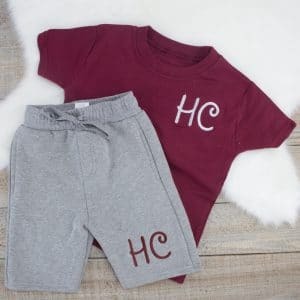 This monogrammed maroon & grey baby loungewear set is this summer seasons must have personalised baby clothes set! This outfit includes a 100% cotton maroon t-shirt & grey fleece shorts for a stylish contrast look in or out of the house this summer! To personalise, simply add your little one's intials to the text box below! 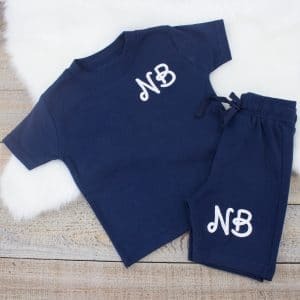 Introducing one of our seasons must have's our monogrammed navy & white baby loungewear set! This outfit includes a 100% cotton navy t-shirt & white fleece shorts for a stylish contrast look in or out of the house this summer! To personalise, simply add your little boy's intials to the text box below! This monogrammed white & grey baby loungewear set is an absolute must have for every little one's summer wardrobe! This outfit includes a 100% cotton white t-shirt & grey fleece shorts for a stylish contrast look in or out of the house this summer! To personalise, simply add your little one's intials to the text box below! Introducing one of our seasons must have's our monogrammed white & navy baby loungewear set! This outfit includes a 100% cotton white t-shirt & navy fleece shorts for a stylish contrast look in or out of the house this summer! To personalise, simply add your little boy's intials to the text box below! Introducing one of our seasons must have's our monogrammed white & pink baby loungewear set! This outfit includes a 100% cotton white t-shirt & pink fleece shorts for a stylish contrast look in or out of the house this summer! To personalise, simply add your little girl's intials to the text box below! 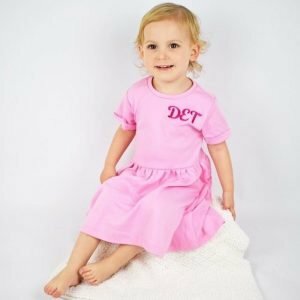 Make your baby girl's summer wardrobe sparkle with our adorable 100% cotton Personalised Summer Dress. A simple yet elegant design, with a button up back and built in romper for easy chaning times that can be personalised free of charge. To personalise, simply let us know your little Princess' name in the personalisation box below!